Listen to me please. You’re like me, a homo sapiens, a wise human. Life, a miracle of the universe appeared around four billion years ago and we humans only 200 thousand years ago. Yet we have succeeded in disrupting the balance that is so essential to life on Earth. Listen carefully to this extraordinary story which is yours and decide what you want to do with it. These are traces of our origins. At the beginning, our planet was no more than a chaos of fire formed in the wake of its star. The sun, a cloud of a good knitted dust particles similar to so many similar clusters in the universe. Yet this was where the miracle of life occurred. Today, life, our life, is just a link in a chain of innumerable living beings that have succeeded one another on Earth over nearly four billion years. And even today,new volcanoes continue to sculpt our landscapes. They offer a glimpse of what our Earth was like at its birth-molten rock surging from the depths, solidifying, cracking,blistering or spreading in a thin crust, before falling dormant for a time. These wreaths of smoke curling from the bowels of the Earth bare witness to the Earth’s original atmosphere. An atmosphere devoid of oxygen. A dense atmosphere, thick with water vapor, full of carbon dioxide. A furnace. But the Earth had an exceptional future, offered to it by water. At the right distance from the sun-not too far, not too near-the Earth was able to conserve water in liquid form. Water vapor condensed and fell in torrential downpours on Earth, and rivers appeared. The rivers shaped the surface of the Earth, cutting their channels, furrowing out valleys. They ran toward the lowest places on the globe to form the oceans. They tore minerals from the rocks and gradually the freshwater of the oceans became heavy with salt. Water is a vital liquid. It irrigated these sterile expanses. The paths it traced are like the veins of a body, the branches of a tree, the vessels of the sap that it brought to the Earth. Nearly four billion years later; somewhere on Earth can still be found these works of art, left by the volcanoes’ ash, mixed with water from Iceland’s glaciers. There they are-matter and water, water and matter, soft and hard combined, the crucial alliance shared by every life-form on our planet. Minerals and metals are even older than the Earth. They are stardust. They provide the Earth’s colors. Red from iron, black from carbon, blue from copper, yellow from sulfur. Where do we come from? Where did life first spark into being? A miracle of time, primitive life-forms still exist in the globe’s hot springs. They give them their colors. They’re called archaeobacteria. 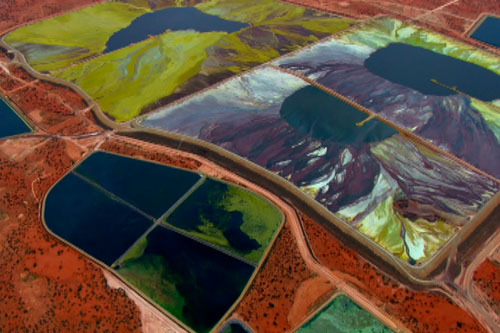 They all feed off the Earth’s heat-all except the cyanobacteria or blue-green algae. They alone have the capacity to turn to the sun to capture its energy. They are a vital ancestor of all yesterday’s and today’s plant species. These tiny bacterias and their billions of descendants change the destiny of our planet. They transformed its atmosphere. What happened to the carbon that poisoned the atmosphere? It’s still here imprisoned in the Earth’s crust. We can read this chapter of the Earth’s history nowhere better than on the walls of Colorado’s Grand Canyon. They reveal nearly two billion years of the Earth’s history. Once upo n a time, the Grand Canyon was a sea inhabited by microorganisms. They grew their shells by tapping into carbon from the atmosphere dissolved in the ocean. When they died, the shells sank and accumulated on the seabed. These strata are the product of those billions and billions of shells. Thanks to them, the carbon drained from the atmosphere, and other life-forms could develop. It is life that altered the atmosphere. Plant life fed off the sun’s energy which enabled it to break apart the water molecule and take the oxygen. And oxygen filled the air. The Earth’s water cycle is a process of constant renewal. Waterfalls, water vapor, clouds, rain, springs, rivers, seas, oceans, glaciers, the cycle is never broken. There’s always the same quantity of water on Earth. All the successive species on Earth have drunk the same water. The astonishing matter that is water. One of the most unstable of all.It takes a liquid form as running water, gaseous as vapor, or solid as ice. In Siberia, the frozen surfaces of the lakes in winter contain the traces of the forces that water deploys when it freezes. Lighter than water, the ice floats, rather than sinking to the bottom. It forms a protective mantle against the cold under which life can go on. The engine of life is linkage. Everything is linked. Nothing is self-sufficient. Water and air are inseparable, united in life and for our life on Earth. 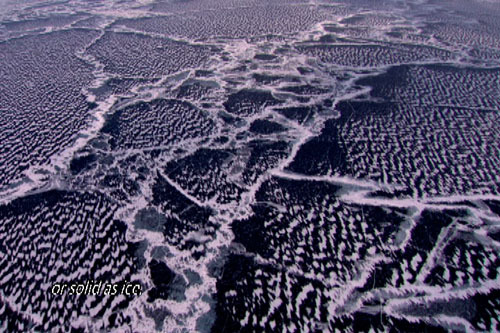 thus, clouds form over the oceans and bring rain to the landmasses, whose rivers carry water back to the oceans. Sharing is everything. The green expanse peeking through the clouds is the source of oxygen in the air. Seventy percent of this gas, without which our lungs cannot function comes from the algae that tint the surface of the oceans. Our Earth relies on a balance in which every being has a role to play and exist only through the existence of another being. A subtle, fragile harmony that is easily shattered. Thus corals are born from the marriage of algae and shells. The Great Barrier Reef, off the coast of Australia stretches over 350,000 square kilometers and is home to 1,500 species of fish, 4,000 species of mollusks and 400 species of coral. The equilibrium of every ocean depends on these corals. The Earth counts time in billions of years. It took more than four billion years for it to make trees. In a chain of species, trees are a pinnacle. A perfect living sculpture. Trees defy gravity. They are the only natural element in perpetual movement toward the sky. They grow unhurriedly toward the sun that nourishes their foliage. They have inherited from those minuscule cyanobacteria the power to capture light’s energy. They store it and feed off it, turning it into wood and leaves, which then decompose into a mixture of water, mineral, vegetable and living matter. And so, gradually, the soils that are indispensable to life are formed. Soils are the factory of biodiversity. 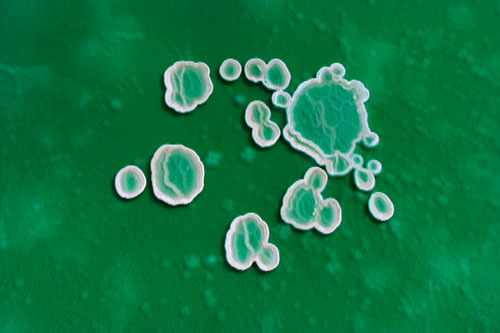 They are a world of incessant activity where microorganisms feed, dig, aerate and transform. They make the humus, the fertile layer to which all life on land is linked. What do we know about life on Earth? How many species are we aware of? A 10th of them? A hundredth perhaps? What do we know about he bonds that link them? The Earth is a miracle. Life remains a mystery. Families of animals form united by customs and rituals that survive today. Some adapt to the nature of their pasture, and their pasture adapts to them. And both gained. The animal sates its hunger and the tree can blossom again. In the great adventure of life on Earth. Every species has a role to play, every species has its place. None is futile or harmful. They all balance out. And that’s where you, Homo Sapiens-“wise human”-enter the story. You benefit from a fabulous four-billion-year-old legacy bequeathed by the Earth. You’re only 200,000 years old, but you have changed the face of the world. Despite your vulnerability, you have taken possession of every habitat and conquered swaths of territory like no other species before you. After 180,000 nomadic years, and thanks to a more clement climate, humans settled down. They no longer depended on hunting for survival. They chose to live in wet environments that abounded in fish, game and wild plants. There, where land, water and life combine. Human genius inspired them to build canoes, an invention that opened up new horizons and turned humans into navigators. Even today the majority of mankind lives on the continents’ coastlines or the banks of rivers and lakes. The first towns grew up less than 600 years ago. It was a considerable leap in human history. Why towns? Because they allowed humans to defend themselves more easily. They became social beings meeting and sharing knowledge and crafts, blending their similarities and differences. In a word, they became civilized. But the only energy at their disposal was provided by nature and the strength of their bodies. It was the story of humankind for thousands of years. It still is for one person in four-over one and a half billion human beings, more than the combined population of all the wealthy nations. Taking from the Earth only the strictly necessary. For a long time, the relationship between humans and the planet was evenly balanced. For a long time, the economy seemed like a natural and equitable alliance. But life expectancy is short, and hard labor takes its toll. The uncertainties of nature weigh on daily life. Education is a rare privilege. Children are a family’s only asset, as long as every extra pair of hands is a necessary contribution to its subsistence. The Earth feeds people, clothes them and provides for their daily needs. Everything comes from the Earth. Towns change humanity’s nature as well as its destiny. The farmer becomes a craftsman, trader or peddler. What the Earth gives the farmer, the city dweller buys, sells or barters. Goods changed hands along with ideas. Humanity’s genius is to have always had a sense of its weakness. Humans tried to extend the frontiers of their territory, but they knew their limits. The physical energy and strength with which nature had not endowed them was found in the animals they domesticated to serve them. But how can you conquer the world on an empty stomach? The invention of agriculture transformed the future of the wild animals scavenging for food that were humankind. Agriculture turned their history on end. Agriculture was their first great revolution. Developed barely 8,000 to 10,000 years ago, it changed their relationship to nature. It brought an end to the uncertainty of hunting and gathering. It resulted in the first surpluses and gave birth to cities and civilizations. For their agriculture humans harnessed the energy of animal species and plant life, from which they at last extracted the profits. The memory of thousands of years scrabbling for food faded. They learned to adapt the grains that are the yeast of life to different soils and climates. They learned to increase the yield and multiply the number of varieties. Like every species on Earth, the principal daily concern of all humans is to feed themselves and their family. When the soil is less generous and water becomes scarce, humans deploy prodigous efforts to mark a few arid acres with the imprint of their labor. Human shaped the land with the patience and devotion that the Earth demands in an almost sacrificial ritual performed over and over. Agriculture is still the world’s most widespread occupation. Half of humankind tills the soil over three-quarters of them by hand. Agriculture is like a tradition handed down from generation to generation in sweat, graft and toil because for humanity it is a prerequisite of survival. But after relying on muscle power for so long, humankind found a way to tap into the energy buried deep in the Earth. These flames are also from plants. A pocket of sunlight. Pure energy-the energy of the sun-captured over millions of years by millions of plants more than a hundred million years ago. It’s coal. It’s gas. And above all, it’s oil. And this pocket of sunlight freed humans from their toil on the land. With oil began the era of humans who break free of the shackles of time. With oil, some of us acquired unprecedented comforts. And in 50 years, in a single lifetime, the Earth has been more radically changed than by all previous generation of humanity. Faster and faster. In the last 60 years, the Earth’s population has almost tripled, and over two billion people have moved to the cities. Faster and faster. Shenzhen, in China, with its hundreds of skyscrapers and millions of inhabitants, was just a small fishing village barely 40 years ago. Faster and faster. In Shanghai, 3,000 towers and skyscrapers have been built in 20 years. Hundreds more are under construction. 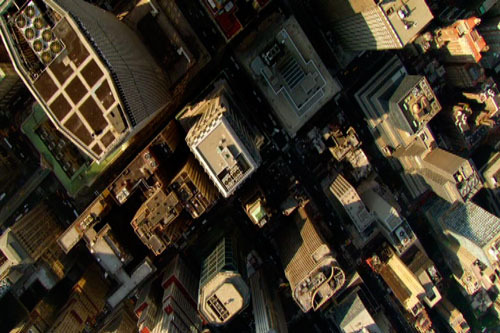 Today, over half of the world’s seven billion inhabitants live in cities. New York. The world’s first megalopolis is the symbol of the exploitation of the energy the Earth supplies to human genius. The manpower of millions of immigrants, the energy of coal, the unbridled power of oil. Electricity resulted in the invention of elevators which in turn permitted the invention of skyscrapers. New York ranks as the 16th-largest economy in the world. America was the first to discover, exploit and harness the phenomenal revolutionary power of black gold. With its help, a country of farmers became a country of agricultural industrialists. Machines replaced men. A liter of oil generates as much energy as 100 pairs of hands in 24 hours, but worldwide only three percent of farmers have use of a tractor. Nonetheless, their output dominates the planet. In the United States, only three million farmers are left. They produce enough grain to feed two billion p eople. But most of that grain is not used to feed people. Here, and in all other industrialized nations, it’s transformed into livestock feed or bio-fuels. The pocket of sunshine’s energy chased away the specter of drought that stalked farmland. No spring escapes the demands of agriculture, which accounts for 70% of humanity’s water consumption. In nature, everything is linked. The expansion of cultivated land and single-crop farming encouraged the development of parasites. 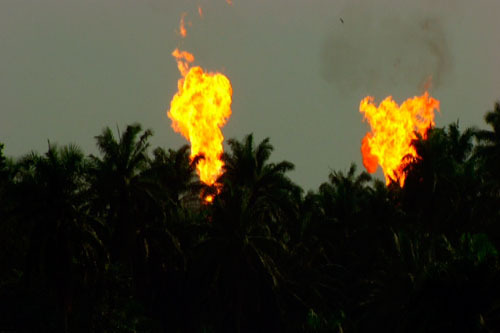 Pesticides, another gift of the petrochemical revolution, exterminated them. Bad harvests and famine became a distant memory. The biggest headache now was what to do with the surpluses engendered by modern agriculture. But toxic pesticides seeped int o the air, soil, plants, animals, rivers and oceans. They penetrated the heart of cells similar to the mother cell that is shared by all forms of life. Are they harmful to the humans that they released from hunger? 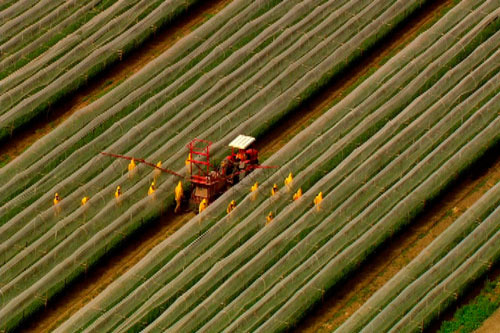 These farmers, in their yellow protective suits, probably have a good idea. The new agriculture abolished the dependence on soils and seasons. Fertilizers produced unprecedented results on plots of land thus far ignored. Crops adapted to soils and climates gave way to the most productive varieties and the easiest to transport. And so in the last century, three-quarters of the varieties developed by farmers over thousands of years have been wiped out. As far as the eye can see fertilizer below, plastic on top. The greenhouses of Almeria in Spain are Europe’s vegetable garden. A city of uniformly sized vegetables waits every day for the hundreds of trucks that will take them to the continent’s supermarkets. The more a country develops, the more meat its inhabitants consume. 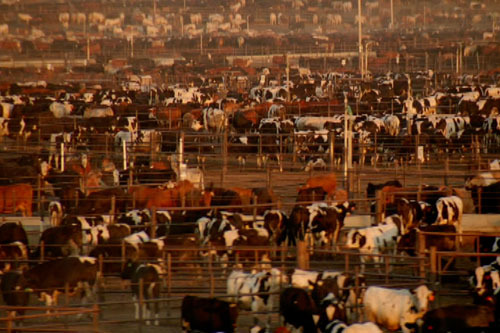 How can a growing worldwide demand be satisfied without recourse to concentration camp-style cattle farms? Faster and faster. Like the life cycle of livestock which may never see a meadow manufacturing meat faster than the animal has become a daily routine. 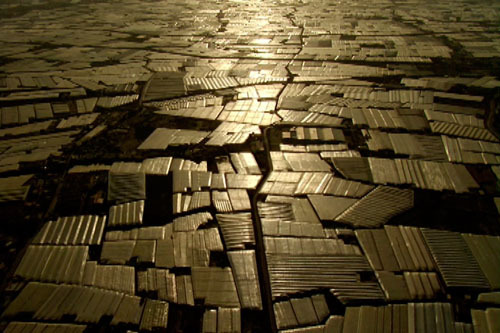 In these vast food lots, trampled by millions of cattle, not a blade of grass grows. A fleet of trucks from every corner of the country brings in tons of grains, soy meal and protein-rich granules that will become tons of meat. The result is that it takes 100 liters of water to produce one kilogram of potatoes, 4,000 for one kilo or rice and 13,000 for one kilo of beef. Not to mention the oil guzzled in the production process and transport. 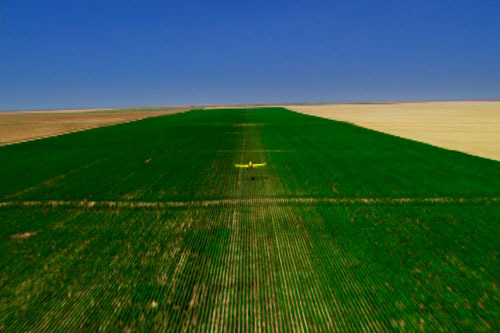 Our agriculture has become oil-powered. It feeds twice as many humans on Earth but has replaced diversity with standardization. It has offered many of us comforts we could only dream of, but it makes our way of life totally dependent on oil. This is the new measure of time. Our world’s clock now beats to the rhythm of these indefatigable machines tapping into the pocket of sunlight. Their regularity reassures us. The tiniest hiccup throws us into disarray. The whole planet is attentive to these metronomes of our hopes and illusions. The same hopes and illusions that proliferate along with our needs increasingly insatiable desires and profligacy. 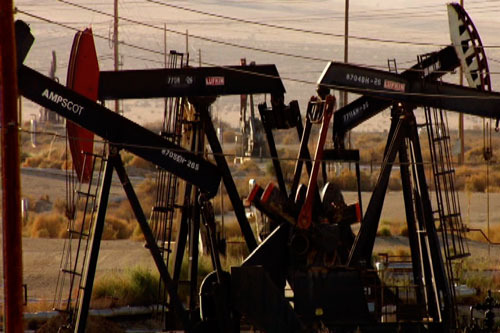 We know that the end of cheap oil is imminent, but we refuse to believe it. 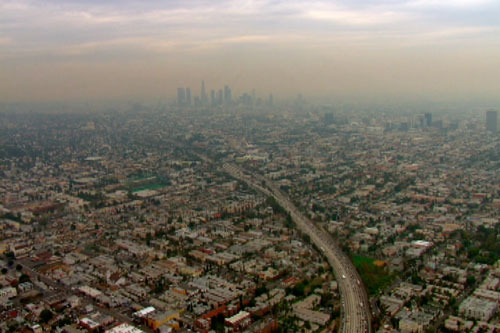 For many of us, the American dream is embodied by a legendary name: Los Angeles. 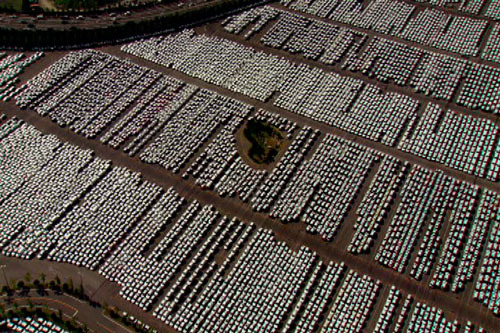 In this city that stretches over 100 kilometers, the number of cars is almost equal to the number of inhabitants. Here energy puts on a fantastic show every night. The day seem to be no more than the pale reflection of nights that turn the city into a starry sky. Faster and faster. Distances are no longer counted in miles but in minutes. The automobile shapes new suburbs where every home is a castle, a safe distance from the asphyxiated city centers, and where neat rows of houses huddle round dead-end streets. The model of a lucky few countries has become a universal dream preached by televisions all over the world. Even here in Beijing is cloned, copied and reproduced in these formatted houses that have wiped pagodas off the map. The automobile has become the symbol of comfort and progress. If this model were followed by every society, the planet wouldn’t have 900 million vehicles, as it does today, but five billion. Faster and faster. The more the world develops, the greater its thirst for energy. Everywhere, machines dig, bore and rip from the Earth the pieces of stars buried in its depths since its creation: minerals. In the next 20 years, more ore will be extracted from the Earth than in the whole of humanity’s history. As a privilege of power, 80% of this mineral wealth is consumed by 20% of the world’s population. Before the end of this century excessive mining will have exhausted nearly all the planet’s reserves. Faster and faster. Shipyards churn out oil tankers, container ships and gas tankers to cater for the demands of globalized industrial production. Most consumer goods travel thousands of kilometers from the country of production to the country of consumption. 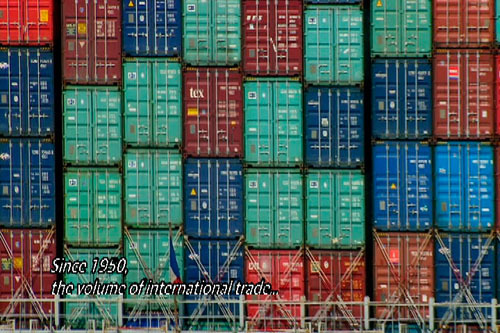 Since 1950, the volume of international trade has increased 20 times over. Ninety percent of trade goes by sea. 500 million containers are transported every year headed for the world’s major hubs of consumption, such as Dubai. 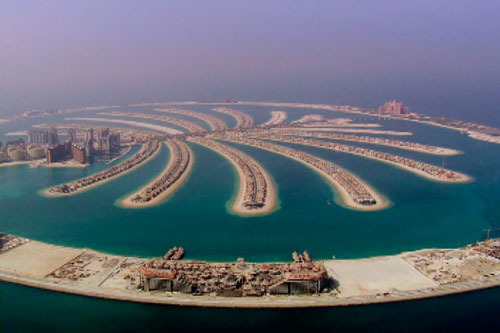 Dubai is one of the biggest construction sites in the world, a country where the impossible becomes possible. Building artificial islands in the sea, for example. Dubai has few natural resources, but with the money from oil, it an bring millions of tons of material and people from all over the world. It can build forests of skyscraper, each one taller than the last, or even a ski slope in the middle of the desert. Dubai has no farmland but it can import food. Dubai has no water but it can afford to expend immense amounts of energy to desalinate seawater and build the highest skyscrapers in the world. Dubai has endless sun but no solar panels. It is the city of more is more, where the wildest dreams become reality. Dubai is a sort of culmination of the Western model with its 800-meter high totem to total modernity that never fails to amaze the world. Excessive? Perhaps. Dubai appears to have made its choice. It is like the new beacon for all the world’s money. Nothing seems further removed from nature than Dubai. Although nothing depends on nature more than Dubai. The city merely follows the model of wealthy nations. We haven’t understood that we’re depleting what nature provides. What do we know of the marine world, of which we see only the surface, and which covers three-quarters of the planet? The ocean depths remain a secret. They contain thousands of species whose existence remains a mystery to us. Since 1950, fishing catches have increased fivefold, from 18 to 100 million metric tons a year. Thousands of factory ships are emptying the oceans. Three-quarters of fishing grounds are exhausted, depleted or in danger of being so. Most large fish have been fished out of existence since they have no time to reproduce. We are destroying the cycle of a life that was given to us. On the coastlines, signs of the exhaustion of stocks abound. First sign: Colonies of sea mammals are getting smaller. Made vulnerable by urbanization of the coasts and pollution, they now face a new threat: famine. In their unequal battle against industrial fishing fleets, they can’t find enough fish to feed their young. Second sign: Seabirds must fly ever greater distances to find food. 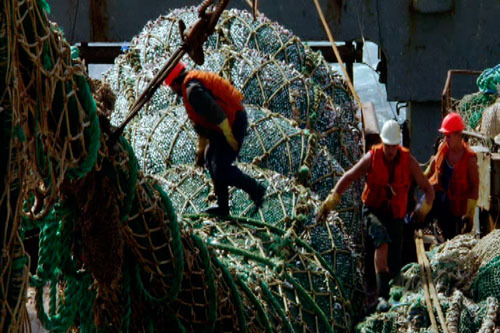 At the current rate, all fish stocks are threatened with exhaustion. In Dakar, traditional net fishing boomed in the years of plenty, but today, fish stocks are dwindling. Fish is the staple diet of one in five humans. Can we envision the inconceivable? Abandoned boats, seas devoid of fish? We have forgotten that resources are scarce. 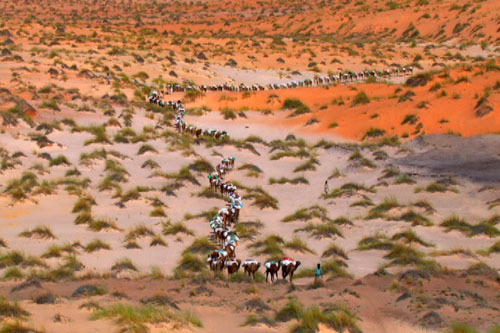 500 million humans live in the world’s desert lands, more than the combined population of Europe. They know the value of water. They know how to use it sparingly. Here, they depend on wells replenished by fossil water,which accumulated underground in the days when it rained on these deserts: 25,000 years ago. 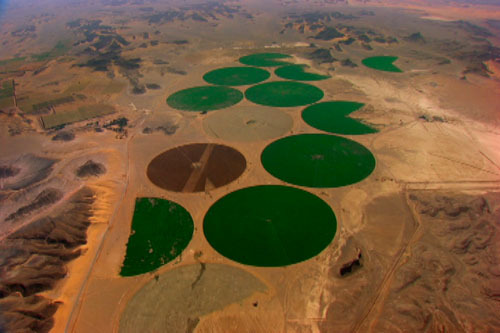 Fossil water also enables crops to be grown in the desert to provide food for local populations. 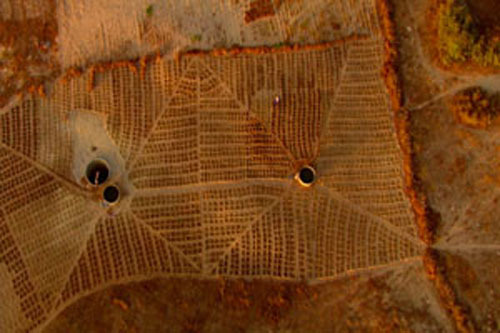 The field’s circular shape derives from the pipes that irrigate them around a central pivot. But there is a heavy price to pay. Fossil water is a nonrenewable resource. In Saudi Arabia, the dream of industrial farming in the desert has faded. As if on a parchment map, the light spots on this patchwork show abandoned plots. The irrigation equipment is still there. The energy to pump water also. But the fossil water reserves are severely depleted. Israel turned the desert into arable land. Even though these hothouses are now irrigated drop by drop, water consumption continues to increase along with exports. The once mighty river Jordan is now just a trickle. Its water has flown to supermarkets all over the world in crates of fruit and vegetables. The Jordan’s fate is not unique. Across the planet, one major river in 10 no longer flows into the sea for several months of the year. The Dead Sea derives its name from its incredibly high salinity that makes all life impossible. Deprived of the Jordan’s water, its level goes down by over one meter per year. Its salinity is increasing. 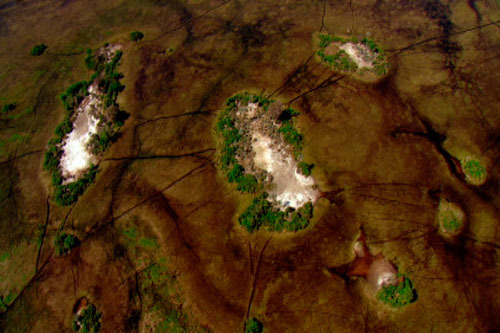 Evaporation, due to the heat, produces these fine islands of salt evaporates beautiful but sterile. In Rajasthan, India. 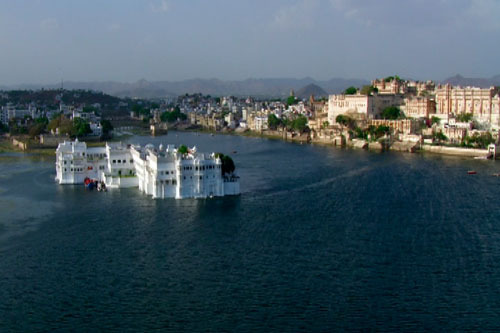 Udaipur is a miracle of water. The city was made possible by a system of dams and channels that created an artificial lake. For its architects, was water so precious that they dedicated a palace to it? India risks being the country that suffers most from the lack of water in the coming century. Massive irrigation has fed the growing population and in the last 50 years 21 million wells have been dug. The victory over famine has a downside, however. In many parts of the country, the drill has to sink ever deeper to hit water. In western India, 30% of wells have been abandoned. The underground aquifers are drying out. Vast reservoirs will catch the monsoon rains to replenish the aquifers. In dry season, women from local villages dig them with their bare hands. Yann is one of my photo idols though I have no desire to take the kinds of photos he takes – airborne. Can’t do it all, alas! Enlightening and reminder to respect our earth. I love the final comments and the mention of hope that there are many humans already on the good path to restore our earth. It is proving successfull and should be used as model for pessimists that there is time and demand for change. Thank you very much for the text! No prob. Spread the news. The video is a great instrument to help us revisit this only place that is our common home. And the transcription is awesome in itself. If I was to do it, I would have to listen to one single sentence at least two or three times. So, this means I would have listened and watched this 1:33 hours video three times! Great job, Elmer/Malate! Somebody’s got to do this Rachid. I have searched the net and find none and so this. You’re much welcome. I really was looking for exactly that, the text of the Yann A. B. documentary, so wonderful job, thank you very much! Now I know why I saved this URL in my google Docs! Can’t believe I ever forgot about it to begin with. Your contribution to the community that is interested in expanding their knowledge about the world, human nature, and our experiences is truly appreciated. Thank you for stopping by my photoblog. Do come back! Hi, Elmer. Many years ago an economist named Thomas Malthus predicted that the human population would exceed our resources. Sadly, continuing with the world’s current population growth and technology, this will probably come true. Mother Nature can only do so much for her survival. Thanx for visiting my blog and have a wonderful day. Thank you very much for this text. It will help greatly to create a little questionnaire for a viewing I am about to do for my students today. Do not worry about rights. In the press conference Yann Arthur Bertrand did with Luc Besson his producer (he also directed many great movies himself) on May 5th 2009 (https://www.youtube.com/watch?v=Cgz5BELaYW0), Yann says that the movie is OURS, there is no copyright attached to it, we have to SPREAD it around us, share with our fellow human beings in order to change things, to make things better for the environment. Thank you again for your fantastic and time consuming work. You too, are helping spreading the word! 🙂 CB from France. Thanks a lot for the text!